2400 seemed to fall from favor at the last component shortage but it by far my favorite for .357 in the Blackhawk. I started to lean to Lil Gun in the slow twist Rossi with heavy for caliber bullets before this topic. 300-MP is another good alternative since 2400 is so difficult to find and LG "eats" guns. Ohio3Wheels wrote: The SDS on the Alliant web site shows it contains both nitroglycerin and nitrocellulose so double base at least in its current formulation. Thanks, hadn't checked that. It had long been my understanding from someplace that 2400 was double base, which is why I referenced it as a ball powder, even tho physically that may not be correct. If you go all the way to page 6 on the SDS they claim it is a small black/gray flake in appearance. 2400 was back at the gunshow this past weekend. first I've seen in a while. If I hadn't had a keg I might have bought some. I wandered by the Center for Forensic Science web site and looked at their info on Alliant 2400. The photomicrograph shows a grayish disk with a few cylindrical pieces thrown into the mix and they show it a single base if I'm reading the component list correctly. Organic chem was a long time ago. The cut length looks to be 1/4 to 3/4 diameter with the majority of what you can see at 1/2 to 3/4 dia. Most of the cylinders show evidence of a couple pieces stuck together after the extrude cut process. Might be a bit of variation due to processing techniques or variations in moisture content during extruding. On another note, I got curious about the differences is Hercules and Alliant 2400 and did a web search. It's not exactly a scientific analysis but several folks have run comparisons with their data books and run comparisons using older lots of powder both opened and sealed against the new production. The results of those informal investigations I managed to sample indicate that the new stuff performs as much like the olds stuff as the normal lot to lot variation in reloading powder that you'd get anyway. In other words while there is a slight variation in density for a given volume, loading by the same weight gives so close to the same results as to be indistinguishable. Those of us without a chrony might want to use data that corresponds to the manufacture date of our powder as much as possible but the variations in the test equipment from manual to manual, maybe variations in bullet construction and over the years and variation in environmental conditions (humidity/pressure/altitude/etc.) is probably responsible for more of the changes in listed load max than anything else. The variation in OUR firearms vs. the TEST article, our environmental conditions and our exact lot of bullets is probably just as great. To bring this back to Lil'Gun for moment. I finally got to the range yesterday with a test ladder using Lil'Gun and my cast Lee 452-300 that goes about 310 with lube and gas check. Closest listing in the Hodgdon manual is for a cast 325 grain with loads ranging from 17.0 to 20.0. My loads went from 17.0 to 19.5. 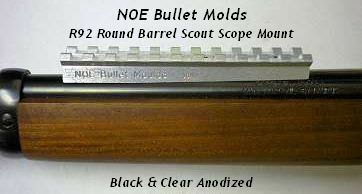 Rifle is a 20" octagonal barrel with a Marbles Improved tang site and factory front. Best load was the 19.5 with a 6" aiming spot at 50 yards five rounds stayed in the spot. I plan to get the next size taller post for the Marbles as shooting these 300 grain chunks of lead I've run out of elevation. I like the Lil'Gun. The loads above 18 grains seem to burn clean with little or no soot on the cases and the recoil doesn't feel as sharp as the equivalent loads with H110. Finally got the target picture done (I think). Last five at the top of the ladder and the post on the Marbles all the way up. Front sight pretty much covers the aim point. Last edited by Ohio3Wheels on 02 Oct 2018 14, edited 1 time in total. Ohio3Wheels wrote: To bring this back to Lil'Gun for moment. I like the Lil'Gun. The loads ... seem to burn clean with little or no soot on the cases and the recoil doesn't feel as sharp as the equivalent loads with H110. I agree and that's why I like Lil'Gun. While the recoil is strong with velocities on the high side, I feel it as a strong push rather than H110's sharp kick (especially with my last 8lb keg of it). And as I said in the opening post, my primers show little flattening or other signs of high pressure as compared to the standard for full power H110 loads, flat primers and stressed brass. I tried some reduced loads; 15.0, 15.5, and 16.0grns with some plated bullets I use for plinking (book minimum for XTP 158grn bullet is 16.0grns). Still a strong recoil and what seemed like high velocities as no discernible drop difference at 200yds so I've loaded up some test loads at 14.0 and 14.5grns to give them a try. I don't feel comfortable going with a lower charge weight even though these plated bullets should use lead bullet load data. I guess that I forgot to mention that my definition of of a 'plinkin' load is likely different than most. For me, my 20" carbine has to reach out to 200yds and my 24" rifle has to reach out to 300yds. I've loaded up some 14.0 and 14.5grn Lil'Gun loads to see if they work but that's pretty low for my needs as I'm looking for about 1,600fps from the carbine and 1,650-1,700fps from the rifle. I don't do short range plinkin at all. BTW, A friend says Quickload predicts about 1,600fps from my rifle with a 13.5grn charge. While I understand that Quickload doesn't handle straight walled calibers very well, I might add a few test loads at that level just for grins. Ive been concentrating on stocking up on 3 powders, 2400, unique and bullseye. 2400 and unique for standard and heavy loads, and bulleyes for light small game loads, in 44 mag/special/russian. 2400 is hard to find around here. I was in lexington last week and stopped by sportsmans warehouse, they had only 2 1lb cans of 2400 in stock. I grabbed one and left the other for the next person. They were priced $23.99 per lb. stopped by cabelas, they eliminated about 60 to 70 % of their reloading supplies from the store shelves. Clerk told me, noone was buying reload supplies so they used the floor space for other things. Got about 7 lbs of 2400 put back so i dont want to use a lot of it right now, in case of another shortage. Several years ago when A2400 became really scarce around here, I decided to find a backup replacement. I started using AA#9 and found it has very similar characteristics to A2400. Very close to the same load weight values - just not exact. I was taught by my late mentor that A2400 and Unique would fit most of my loading needs, but found out that AA#9 and AA#5 would make very good substitutes, if not outright replacements. AA#7 also fits in well. I found 1 lb of #7 in my storage that i got a few years ago, think i had planned on using it for 45-70. Ive been putting back unique for some standard 44 loads, loads that i got from Elmer in 6guns. There nothing special, just standard loads for general purpose 250 gr rds. I found 2400 at midway, but they charge $20 plus for shipping. I cant bring myself to do that. I bought these oregon trail 44 slugs a while back, and was wanting to use 2400 with them. I was wanting a good stout 2400 load with these true shot bullets for bear/big cat protection. I will probably put back 5 lbs of 2400 and then use the other 2 lbs right now, then replace them when i get a chance. And just keep the 5lbs in reserve. I have been using bullseye lately with wadcutters, and soon i will try rd ball, and Elmers shot load using bullseye, inverted gas checks and #9 shot. I find myself very cautious with using my powder and primers, due to the shortage a few years back. Mad Trapper wrote: I find myself very cautious with using my powder and primers, due to the shortage a few years back. That's a shame. I'm really fortunate to be in a range club where we throw in on group bulk buys. We have 1,100 members in our range club and we've got our own ffl license so we can buy at wholesale prices with no markup. When we do a group buy (usually 1 or 2 times a year), it's a huge order. Our last bullet order was a full rail car load (almost 950,000 bullets) on pallets we picked up at the rail head in a fleet of pickup trucks. That's why every one of the 'shortages' found me with full stores so I didn't have to cut back in my shooting.